Over the past month, U of T Campus Police have received reports of over 25 thefts at the St. George campus. The majority of the thefts were electronic devices, such as mobile phones and laptops, at campus libraries. 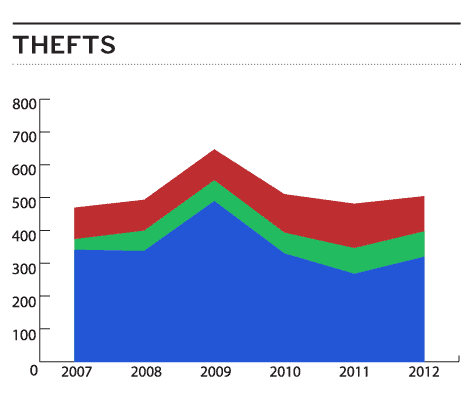 Although the number of thefts has increased recently, the number of overall crimes has decreased at the St. George and Scarborough campuses over the past decade. 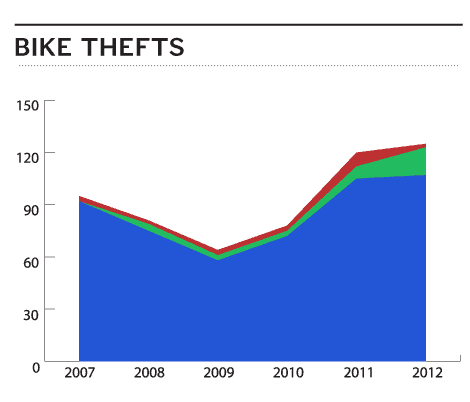 Over the same time span, there has been an increase in crime at the Mississauga campus. In 1999, the number of crimes reported to U of T Campus Police at the St. George campus reached 1,410. This figure has more than halved in recent years, with the most recent statistics suggesting that 647 crimes were reported in 2012. In the last five years, there has been a gradual rise in theft — particularly at Mississauga and Scarborough — theft has more than doubled from 32 in 2007 to 77 in 2012. Meanwhile, St. George and Scarborough have seen a more recent increase in bike thefts, as cycling becomes a more popular mode of transport for students. Across the three campuses, theft under $5,000 continues to be the most prevalent crime overall — with smartphones, laptops, and tablets being the most common items stolen. In response to the increase in these crimes, Campus Police have spoken with students about ways to keep their belongings safe. For example, the Security Tracking of Office Property (S.T.O.P) program installs special identification plates on laptops to make it easier to recover the computer if it’s lost or stolen. 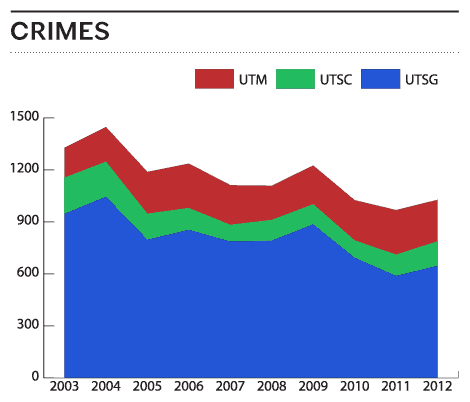 Stephens attributes the variations in crime rates between campuses to “factors such as campus location, populations served, numbers of buildings, and crimes reported to campus police rather than municipal police all contribute to the variations in the data.” For example, UTSC has a student population of 10,000 and UTM has a student population of 13,000. In comparison, St. George has a student population of 40,000 students. While St. George reports the most crimes annually, Mississauga has seen the biggest increase in crime rates. This is likely credited to their rapidly growing student population. Stephens attributes the overall trend at St. George to its downtown location, as the level of crime tends to be correlated with the city’s crime rate. “Typically, we find any increase in crime statistics is usually in relation to any increase in crime in the city overall,” Stephens noted. In the last six years, Toronto has had the lowest reported crime rate in the country for a metropolitan city. Nonetheless, the university area and surrounding neighbourhoods — including the Bay Street Corridor and Kensington-Chinatown area — are some of the top-ten neighbourhoods in Toronto for crime.